^ Finally, single Shiv Jayanti. The Times of India (Pune). 4 February 2003 [27 January 2010]. ^ Bhawan Singh Rana. Chhatrapati Shivaji Maharaj. A.H.W. Sameer series. Diamond Pocket Books (P) Ltd. 2005: 11. ISBN 978-81-288-0826-5. ^ Bhawan Singh Rana. 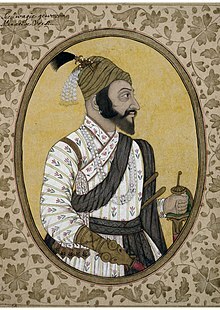 Chhatrapati Shivaji. Diamond Pocket Books (P) Ltd. 1 January 2005: 18. ISBN 81-288-0826-5. ^ Manu Balachandran. WORTH IT? : India is about to spend a ridiculous $500 million on a statue in the middle of the Arabian sea [值得嗎？印度將會荒唐的花上過五億美元在阿拉伯海中興建雕像]. Quartz India. 2016-12-23 （英语）. 恩·克·辛哈 阿·克·班纳吉. 《印度通史》 (M)使用|format=需要含有|url= (帮助) 2. 北京: 商务印书馆. 1973: 672～678. Shivaji and the Decline of the Mughal Empire by M. N. Pearson, The Journal of Asian Studies, February 1976. Shivaji -- Portrait of the King as Barbarian by Kedar Joshi, Chowk.com, January 5, 2006. Shivaji: Looking Beyond Prejudices by Saurav Basu, Boloji.com, May 3, 2009. The hijacking of Shivaji Maharaj by vested interests by François Gautier, Daily News and Analysis, November 23, 2011.